“BATWING: ENEMY OF THE STATE” continues! Batwing learns the hard way that you can’t bring justice to a country that doesn’t want it! 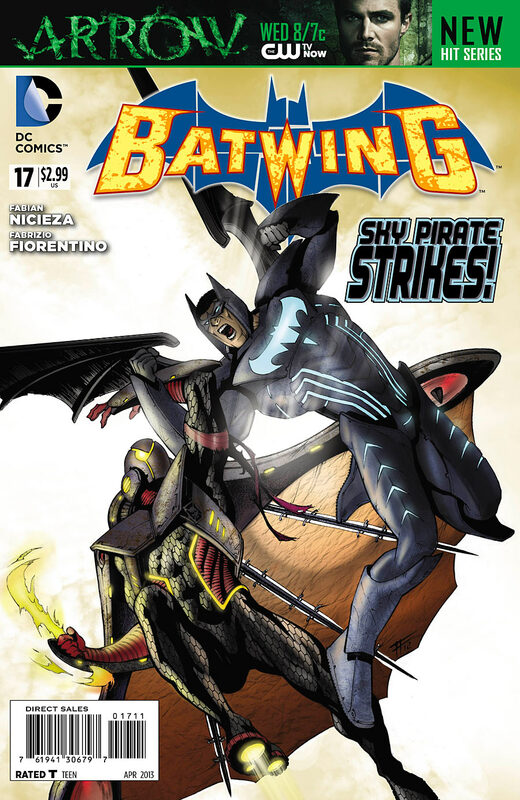 Plus: Batwing battles the Sky Pirate! Cover- Not the best we’ve ever had but the villain and hero both get highlighted well enough. Tension- Fabian Nicieza has raised the stakes in this tale! Both David’s civilian and superhero identities are in way over their heads and are outgunned, out-manned and out of their depth. Not since the opening arc where Batwing fought Massacre has this title had this much on the line! His base also comes under attack as the issue wraps and Matu Ba, his Alfred, may well die in this arc. Art-Fabrizio Fiorentino’s art suits the tale though still falls short of the opening arc of this series. Black Heroes- This issue we witness the return of Dawn but not as a hero so much as one of the villains! What a switcheroo! Action- Aerial battles, gun fights and chase scenes? All here! Diversity- So the main villain is the sky pirate who’s Asian along with his crew while everyone else in the issue was clearly black. That’s very different than everything else offered by mainstream but I can see why this would not appeal to white America. Cover- While I did like the cover the background was far too sparse for my taste. Art- The interiors will not win any new fans as they are a far cry from what came before.